Kafka’s story is a typically elusive and mysterious allegory which has been variously related to the inflated human ego, the arrogant scientific ego, the anxieties of intellectual alienation, and Jewish assimilation (the story was first published in a Zionist magazine). 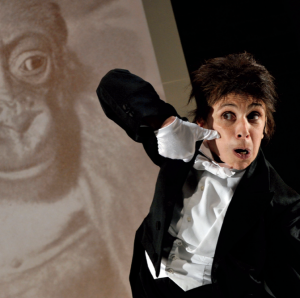 In Kafka’s Monkey, Hunter’s uncanny performance becomes the central subject as she crouches, flexes, grooms and contorts herself while swigging from a hip flask and spitting and swearing to demonstrate her earliest forms of human imitation. Effectively sentenced to a life of performing, this resourceful ape is as desperate and determined as a Beckett tramp, longing for home and freedom yet settling for the dubious comforts and pseudo-freedom of the theater.